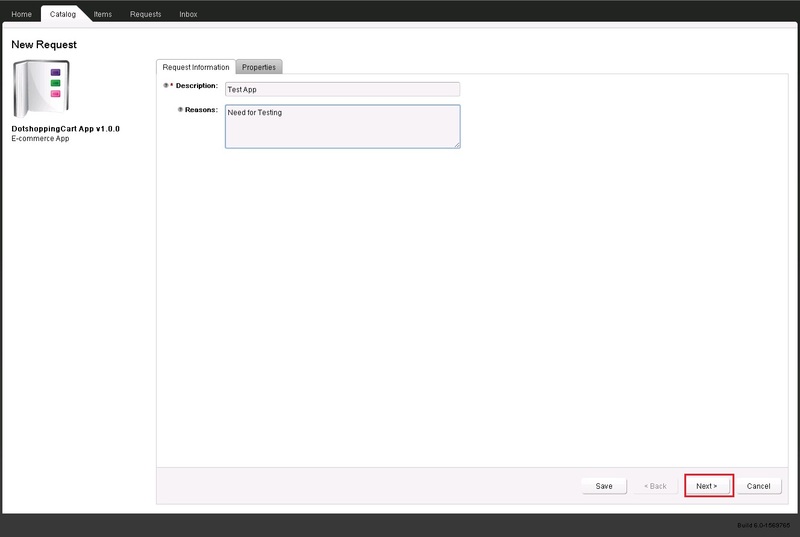 In this final blog post of the series “Platform-as-a-Service with vCloud” we will see how an end user/developer/Administrator can request a PaaS from the vCAC Service catalog. 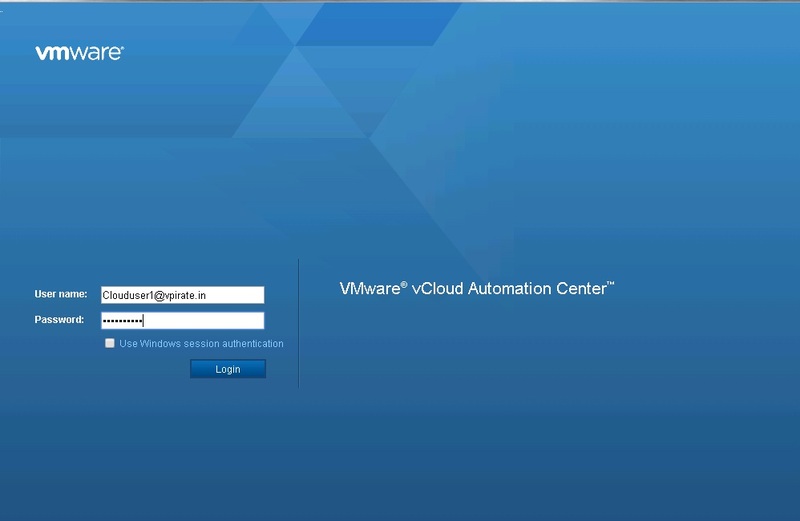 A typical user in vCloud Automation Center does not have direct access to the vCloud Application Director environment. 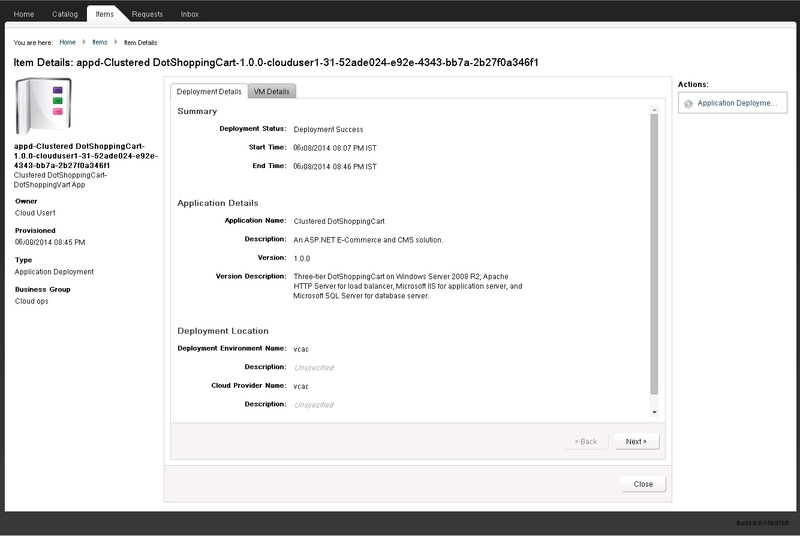 Therefore, the user can access the vCloud Automation Center service catalog, which is a self-service portal and request vCloud Application Director application deployments. In our previous 9 posts we have seen all the steps involved deploying the App Director to publishing a App Director blueprint as a catalog item on the vCAC Service catalog. So in this post we will safely assume that all the steps have been followed from all the previous posts and the PaaS item is published as a catalog item on the vCAC Service catalog and is ready to be deployed. Let us login into the vCAC Self-service portal as a end-user/developer(Make sure that you log in to the vCloud Application Director appliance as an SSO user that has APPLICATION PUBLISHER and DEPLOYER roles assigned to it from the vCloud Automation Center user interface) who needs to deploy a DotShoppingCart App(I know its PaaS but we are talking about deploying an App, well its a very thin line between PaaS and AaaS isn’t it?). 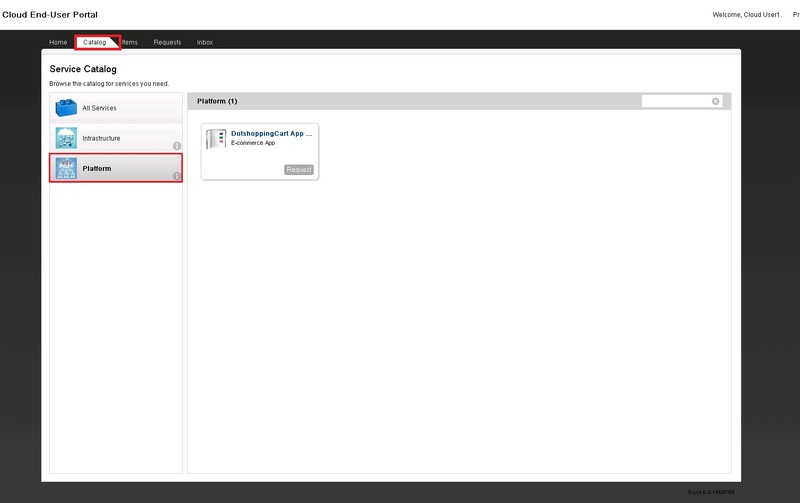 Select the Catalog tab and then select the service which will have the catalog item you need to deploy. In our case its Platform. This opens up a new request form where you will have to fill in couple of details. You will have to enter a description and reason for requesting this particular catalog item. Click Next. Now review the properties of the App being deployed. 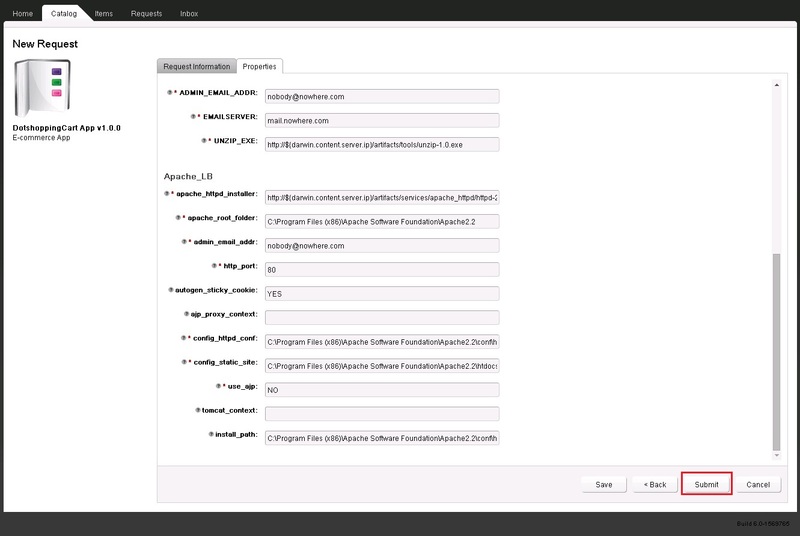 You will be able to edit properties such as database passwords and user details. Once done., Click on Submit. This will trigger the deployment workflow. If there are any approvals, then after the approvals are done, the App gets deployed. 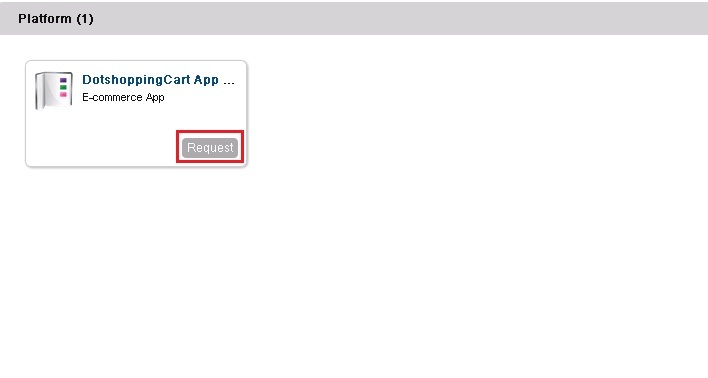 Once the app is deployed, you will be able to see it in the Items tab under Application Deployments. Also it will give you the details of the VM’s that have been deployed as part of the App deployed under the VM Details tab. Now you have your application deployed and ready to test/Use. This completes our journey of achieving PaaS with vCloud. What is the URL or a text that is to be entered in DSC-ZIP option while requesting for the application deployment through vCAC? When I try to submit the request it throws an error asking to fill the text field of DSC_ZIP. When I went back to the Application Director, I found that the we have to enter a URL or a text to that field. So can any random text be filled? You will need to download the OpenSourceEdition.V3.zip from http://dotshoppingcart.codeplex.com/releases/view/47679 and put it as in a webserver from where you can access it. In the DSC_ZIP field, you need to mention the URL for it. The DCS_ZIP will be http://webserver.example.com/OpenSourceEdition.V3.zip. I put it on App director machine itself as it can transfer files over http. Thanks Abhilash. When we request for the service from vCAC it takes a lot of time to get deployed. The status of the requested machine will be “In Progress” for more than an hour. In fact two deployments took about 2 hours each and yet it failed. The reason for it to fail is because of the DSC_ZIP value. That value is not a concern. But time taken to deploy is. Is it the same for you? Why does that take so much time? It usually takes around 20-30 mins for the app to get deployed. Time is not a concern. If it fails after taking such a long time then you need to see what’s going wrong. Did you do what i mentioned in my previous comment? If you gave the right values for the URL it would not fail. There are of course many other reasons why a deployment might fail. See the logs and see what’s going wrong. I’m yet to follow what you suggested. Apart from that application I just deployed 2 more simple applications to understand the working of AppD with vCAC. 1)Cent OS with Apache service and 2) A basic Windows machine. The machines got deployed on the vCenter and it’s up and running fine. But in the Requests tab the task is still “In Progress”. It’s almost one and half hour since I deployed it. Just wanted to know the reason for this. Have you pre-installed bootstrap agents on these servers? If they do not find the agent they will redo the task of finding it. I have seen those kind of deployments last hours and fail in the end. I have not done that. I may have to give it a try. Yeah, I am facing the same issue. In your blog its mentioned only for Windows machine. How about a installing bootstrap agents for a Linux machine?